“God is an absentee landlord,” shouted the devil, “I’m here on the ground with my nose in it since the whole thing began!” He always sought to tempt from a position of mischief. But even speaking through Al Pacino man still rejected him. The Gospel according to John called him ‘a murderer from the beginning.’ So when the General Synod of the Church of England replaced references to him with the anodyne ‘evil’ on July 13th 2014, the game was up. He had been expected to go out every day and deliver the pain for God. As the CEO of hell, Rowan Atkinson had him organising those newly arrived in purgatory into murderers, looters, lawyers and the French (and with no access to toilets: damnation without relief). Always he was looked to as the administrator of the worst of humanity and was hated for it. Why? It’s just the job he got stuck with, Kent Anderson observed. He led the evil empire long before Ronald Reagan had heard the term. And he became more than simply Old Nick. He became an idea. Invoked to express human opposition and to characterise human enemies, Elaine Pagels saw him as the interpretation of human conflict and a standing puzzle in the history of religion. But was this too much responsibility, even for a fallen angel? Is not the inconvenient truth that man needed the devil, to explain the worst in himself and eschew responsibility? God wrote to man: “You invented terms like ‘just wars’ and ‘friendly fire.’ And it was you that didn’t know when to stop digging deeper and when to stop building higher.” But man had stopped listening. He preferred to blame the father of lies; Dante’s ill worm that pierces the world’s core. It hadn’t always been this way. For much of his early career the devil was the servant of God. He was necessary. He tested the fortitude of Job. The Hebrew bible and the only story in the New Testament in which the devil got a look in – the Temptation of Christ – contained the sense of a dilemma: if God is omnipotent, where does evil come from? Neither Christianity nor Judaism has ever supplied an adequate answer. The second and third centuries AD were the heyday for apocryphal stories about the devil. The Manichean heresy, built on pagan and Christian gnostic beliefs, argued for the existence of good and evil forces. The two are in permanent conflict, with the human world of flesh and sexuality entirely governed by the force for evil. But the heresy said that trapped within man is a spiritual element which means he belongs also to another world of truth. The purpose of human existence then, was to escape from the dark to the light. Augustine started as a Manichean but then rejected the doctrine. In orthodox Christianity he rejected the Manichean ideas, limiting the role of the devil and claiming evil is simply the absence of good. The devil fought for his place in the human soul. The Black Death led to an existential crisis for Christianity. If priest and pauper alike were dying, what could be said for the omnipotence of the church? Perhaps there was another force, as powerful or perhaps more powerful than God. In Robert Frost’s opinion, we dance around in a ring and suppose, but the secret sits in the middle and knows. Was the secret God or another? But it was the Reformation that saw the devil really up his game. The idea took root that the devil was out to destroy God. This was a radical departure from the somewhat benign temptations he had placed in front of Christ. Appealing for a demonstration of supernatural powers was an attempt to draw Christ away from being who he was. Violence and torture had not entered the script. But it suited the late medieval church to promote the devil and his alliance with humans through the cult of witchcraft as a way of explaining its own internal crises. The church split. The opposite was demonised. Man separated from God. Milton’s Paradise Lost, published in 1667, was another boost. Matthew 7 had set the scene. Describing evil as coming from a person, rather than going in, it suggested the evil the Lord’s Prayer protected man from was that which he was capable of, not that may assail him from outside. The description of man as an individual, separate from God and responsible for his own actions built on this doubt. But a psychological journey into the soul of modern Europe appealed to the Enlightenment and just as Eve had been tempted by the devil in the garden of Eden when she was on her own, separated from Adam, so the devil saw his chance again. The whispers were listened to: the church can no longer protect you; you are on your own. It helped that intellectuals were slow to deny the existence of devils and witches. Intricately linked to other spiritual beings such as angels and, indeed, God, to deny the existence of one was to deny the existence of the other. Better then not to deny. D H Lawrence opined that devils belong to man, he must accept them and be at peace with them. But if, as Philip Almond says, the devil objectifies the often incomprehensible evil that lies within us and around us, are not God and the devil mutually exclusive? 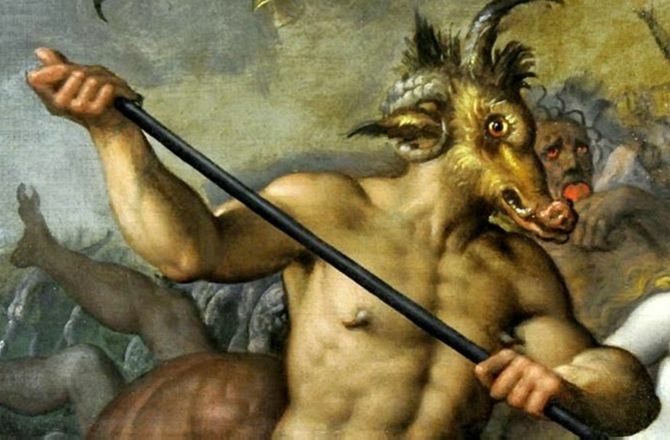 If the church now teaches that the devil was only symbolic, cannot the same be said for God? The devil would love that idea. It may be a pyhrric victory but by denying the existence of the devil, perhaps man has also killed God. The greatest trick the devil ever pulled was convincing the world he didn’t exist. And like that…he was gone. The picture above is a detail from a 16th-century painting by Jacob de Backer in the National Museum in Warsaw.